1. Cover, Concealment, Covert, Screen : ڈھکن - آڑ : (noun) a covering that serves to conceal or shelter something. 2. 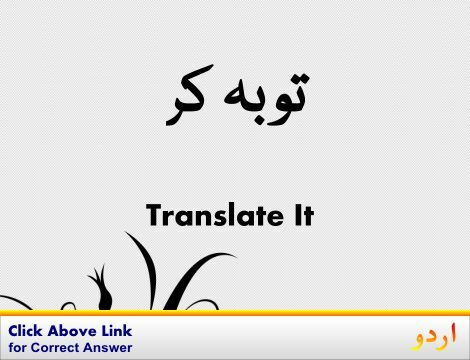 Cover : ڈھانپنا : (verb) provide with a covering or cause to be covered. Cover her face with a handkerchief. Daub, Smear - cover (a surface) by smearing (a substance) over it. 3. Cover, Blanket : کمبل - لحاف : (noun) bedding that keeps a person warm in bed. Cover yourself in a blanket. He pulled the covers over his head and went to sleep. Mackinaw, Mackinaw Blanket - a thick plaid blanket formerly used in the northwestern United States. 4. Cover, Covering, Masking, Screening : چھپانا : (noun) the act of concealing the existence of something by obstructing the view of it. Concealing, Concealment, Hiding - the activity of keeping something secret. 5. Cover, Back, Binding, Book Binding : کتاب کی جلد - جلد سازی : (noun) the protective covering on the front, back, and spine of a book. 6. Cover, Covering, Natural Covering : غلاف : (noun) a natural object that covers or envelops. Blanket, Mantle - anything that covers. 7. Cover, Comprehend, Embrace, Encompass : احاطہ کرنا : (verb) include in scope; include as part of something broader; have as one's sphere or territory. 8. Cover, Covering Fire : ڈھال : (noun) fire that makes it difficult for the enemy to fire on your own individuals or formations. 9. Cover, Cross, Cut Across, Cut Through, Get Across, Get Over, Pass Over, Track, Traverse : سفر کرنا - سفر طے کرنا : (verb) travel across or pass over. The caravan covered almost 100 miles each day. Jaywalk - cross the road at a red light. 10. Cover, Cover Up : چھپانا : (verb) hide from view or knowledge. The President covered the fact that he bugged the offices in the White House. 11. Cover, Insure, Underwrite : بیمہ کرانا - ضمانت لینا : (verb) protect by insurance. Guarantee, Warrant - stand behind and guarantee the quality, accuracy, or condition of. 12. Cover, Compensate, Overcompensate : ازالہ کرنا : (verb) make up for shortcomings or a feeling of inferiority by exaggerating good qualities. Cover, Insure, Underwrite - protect by insurance. 13. Cover, Enshroud, Hide, Shroud : ڈھانکنا - لپیٹنا : (verb) cover as if with a shroud. 14. Cover, Overlay : ڈھانپنا : (verb) put something on top of something else. Cover the meat with a lot of gravy. 15. Cover, Brood, Hatch, Incubate : انڈوں پر بیٹھنا - بیانت : (verb) sit on (eggs). Multiply, Procreate, Reproduce - have offspring or produce more individuals of a given animal or plant. 16. Cover, Wrap Up : ڈھانپنا : (verb) clothe, as if for protection from the elements. Apparel, Clothe, Dress, Enclothe, Fit Out, Garb, Garment, Habilitate, Raiment, Tog - provide with clothes or put clothes on. Conceal, Hide : چھپانا : prevent from being seen or discovered. "Muslim women hide their faces"
Cover Crop : بچاوٴ فصل : crop planted to prevent soil erosion and provide green manure. Cousin-German : چچا زاد یا ماموں زاد بہن یا بھائی : the child of your aunt or uncle. How this page explains Cover ? It helps you understand the word Cover with comprehensive detail, no other web page in our knowledge can explain Cover better than this page. 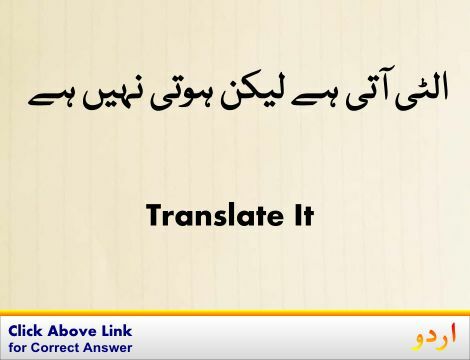 The page not only provides Urdu meaning of Cover but also gives extensive definition in English language. The definition of Cover is followed by practically usable example sentences which allow you to construct you own sentences based on it. You can also find multiple synonyms or similar words on the right of Cover. All of this may seem less if you are unable to learn exact pronunciation of Cover, so we have embedded mp3 recording of native Englishman, simply click on speaker icon and listen how English speaking people pronounce Cover. We hope this page has helped you understand Cover in detail, if you find any mistake on this page, please keep in mind that no human being can be perfect.